A little History - Jumpsuits were originally used by parachuters/skydivers as a utilitarian one piece garment but has been making its appearance in the fashion industry often. It is also used by Sportsperson, Manual Labourers, Institutions and Kid's Fashion. The comeback of the Jumpsuit trend from 60's and majorly in 80's have left me obsessed with it. Like when in doubt we go for Red or go for Black and so on. 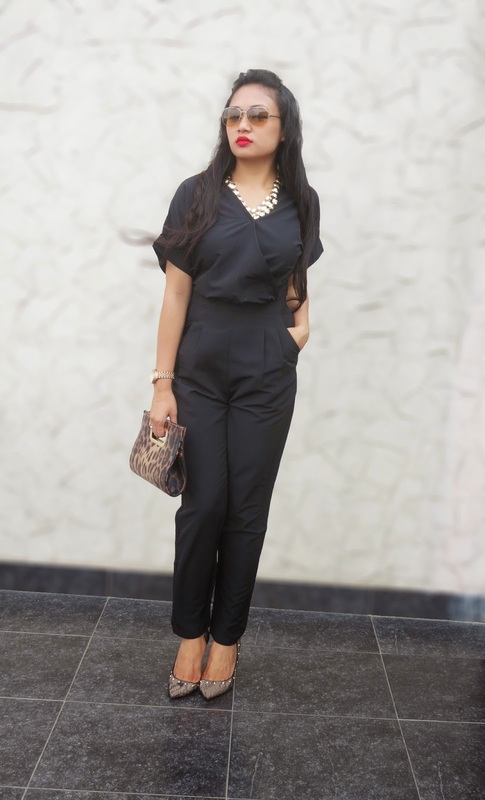 I go for a Jumpsuit when in doubt where I don't have to think what to pair it with. It is a comfort attire to another level altogether. Particularly in this number i like the way how its Kimono sleeves and high waisted Pleated bottoms helps to accentuate the smallest part of my torso which is my waist and also elongates my legs making me look a little taller than I am. Great to sport this look for evening hangouts with your girls. I added this bright yellow blazer for those chilly Fall evenings to keep me nice and warm. Accessorized with a golden layered necklace, a few golden midi rings, lace detailed pumps for that edge and golden studs on them(shoes) to connect my accessories together. The leopard print clutch and red lips/nails, which is a great combination on its own, adds a little drama to the whole look. And how do i forget my aviator sunnies which really connects my outfit to its core history.